The authors of “Code of Practices for Fair Use in Media Education” might just as well be describing me, when they write, “Most ‘copyri ght education’ that educators and learners have encountered has been shaped by the concerns of commercial copyright holders, whose understandable concern about large-scale copyright piracy has caused them to equate any unlicensed use of copyrighted material with stealing.” While the Code of Best Practices in Fair Use for Media Literacy Education was published more than a year ago, I still have questions about how it applies to my own teaching and to my students’ digital compositions. And I don’t think I’m alone either. 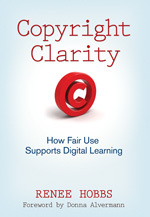 So I thought having a chat with Renee Hobbs and Troy Hicks, two people who’ve thought a lot about this, might help me (and other teachers like me) think through the copyright doctrine of fair use. We asked Renee to talk about her background, how she got to this place where she is, a media educator at Temple University. In November 2008, educators were introduced to the “Code of Best Practices in Fair Use for Media Literacy Education, by Renee Hobbs, Peter Jaszi, and Patricia Auferheide. We also asked her how and why the three of them created this code? Troy Hicks wrote a book The Digital Writing Workshop and an article “Transforming our understanding of copyright and fair use”. Given that he had written a book that advocates how to teach digital writing, we are happy to have his thoughts on Renee’s work during this podcast. At the end of the section, “What is transformative use?” Troy writes: “If we as educators can invite our students to think critically about their use of copyrighted materials in the process of creating their own digital compositions, and help them understand what it means to build on the work of another in a transformative way, then we can open up thought-provoking discussions about how we compose in the 21st century.” Can you say more about that Troy? How does that look in your own teaching? Now some teachers might not think that this document pertains to them because we might not all understand the title and/or the concept of “Fair Use,” but one of the things I notice pretty quickly about the document (on page 2) is that media literacy is often embedded in other subject areas. Additionally the description of Media Literacy Education seems to describe what students do in Youth Voices a lot of the time, and what more students will be doing the more they create digital compositions. The Guide addresses… “the transformative use of copyrighted materials in media literacy educations that can flourish only with a robust understanding of fair use…. The Supreme Court has pointed out that fair use keeps copyright from violating the First Amendment…. Fair use helps ensure that people have access to the information they need to fully participate as citizens. The fair use doctrine allows users to make use of copyrighted works without permission or payment when the benefit to society outweighs the cost to the copyright holder.”“for any particular field lawyers and judges consider expectations and practice in assessing what is ‘fair’ within that field. So in essence we’re talking specifically about fair use in an educational setting, about how fair use applies to student digital compositions published on the Internet – Youth Voices.The Fair use Doctrine (section 107) of the Copyright Act of 1976 states that the use of copyrighted material “for purposes such as criticism, comment, news reporting, teaching (including multiple copies for classroom use), scholarship, or research” is not infringement.In weighing the balance at the heart of fair use analysis, judges refer to four types of considerations mentioned in the law. Applying the doctrine of fair use requires a reasoning process, not a list of hard-and-fast rules. It requires users to consider the context and situation of each use of copyrighted work. So we want you to join us. We’ll present a couple of cases from our work on Youth Voices. 20:58:11 SusanEttenheim: hi gail can you hear us? 20:59:32 LangLabCindy: Sound was fine, but now don't hear anything. 20:59:57 SusanEttenheim: welcome! where and what do you teach? 21:01:22 LangLabCindy: thanks! should i be hearing something? 21:04:23 SusanEttenheim: please introduce yourself - where and what do you teach? 21:05:12 SusanEttenheim: soccerdebla - where and what do you teach? 21:05:57 LangLabCindy: Susan, are you with AALF? 21:06:09 SusanEttenheim: yikes ... what is aalf? 21:07:36 Paul Allison: I think all the fair use / creative commons / digital rights stuff keeps shifting for me... think about what it looks like for students. 21:13:54 SusanEttenheim: hi connie! welcome! 21:14:08 SusanEttenheim: please introduce yourself! where and what do you teach? 21:14:51 LangLabCindy: ORMATIVE - oops - fingers slipped! 21:17:25 SusanEttenheim: Fred - do I remember that you teach at VHS ? 21:17:30 SusanEttenheim: Today is my first day! 21:18:32 LangLabCindy: Had a wonderfully successful copyright lesson with students in a drama class - approached it from the standpoint of their being creators and deciding how others can use their creative works. Much better than what you cannot do! 21:18:34 Fred Haas: @Susan - You got it right. Congratulations! You are starting just as they are going to switch to a new course management software in the fall. 21:19:25 LangLabCindy: www.copyrightfriendly.wikispaces.com is a resource I share with our teachers and students. 21:20:01 Fred Haas: Great point. Creative Commons is not about fair use. It is about expanding the opportunities for getting permission. 21:20:27 SusanEttenheim: hi minhaaj welcome! please introduce yourself - where and what do you teach? 21:21:10 minhaaj: I dont teach at the moment. I used to teach English. I am studying for Masters in Management Sweden atm. 21:22:41 Gail Desler: Thanks, Rene. I'll send your answer on to the teacher. And, yes, how you tell the story of Haiti without visually showing the devastation?! 21:24:17 Fred Haas: On some level, it seems like Creative Commons offers a kind of legal comfort for using material that is not your own. It offers a safe choice. 21:25:41 SusanEttenheim: maureen and vstokes - where and what do you teach? 21:26:04 SusanEttenheim: hi joel welcome! 21:26:08 vstokes: I am a librarian in Missouri. 21:26:53 Fred Haas: @Susan - Right, but you might not need to find a CC image of a famous photographers work. It really depends on how you are planning to use the image. 21:26:56 SusanEttenheim: snow in buffalo? 21:27:05 LangLabCindy: Key point that citing and permission are different things...hard concepts for folks to understand. 21:28:06 SusanEttenheim: Fred - it's nice if you're talking about an image... to see it..
21:29:15 SusanEttenheim: maureen - snow there? 21:29:25 Paul Allison: So the kids who say that if it's on the Internet I can use it are right? 21:29:28 Fred Haas: @Susan - You should be able to use it without fear, especially if you are using it in a classroom setting that is transformational in nature, meaning you are using it as a tool for the study of composition or similar purposes. 21:29:33 Maureen: Just a few flurries now and then. Maybe a bit tomorrow. 21:31:19 Fred Haas: I am esperiencing this complexity in earnest now that I am teaching a journalism class, as well as a typical English class. Beginning to explain some of the norms of different discourse communities offers a good view of students' heads spinning! 21:31:38 Maureen: I had 6th graders who wanted to use the Life photos on google images for a project. I said no, since it wasn't transformative use... still tend to go for safe vs sorry. 21:31:45 SusanEttenheim: @fred so I don't really mind leaving BB - are you doing the d2l early learner thing..? 21:33:01 SusanEttenheim: maureen - do you have skype? 21:33:28 LangLabCindy: Doesn't it depend on the project - where will it go? 21:33:52 SusanEttenheim: what platform are you using? 21:34:06 Fred Haas: @Susan - I was just looking into that today. I haven't decided. I may end up taking a new PD course in the next round, and apparently they are shifting all of their PD courses to D2L. So I may get my first experience that way. I am still investigating. 21:34:13 Gail Desler: Whose slideshow? 21:34:29 Troy Hicks: Maureen -- so, in what ways were they using the images in the timeline? 21:35:18 Maureen: Just as images to represent athletes, posters, etc... of the different years. 21:35:51 Troy Hicks: How "big" is "society" -- one classroom? one student? 21:35:51 minhaaj: ok got it. 21:36:40 SusanEttenheim: minhaaj and vitmarchik and cbruckner - please introduce yourself! where and what do you teach? 21:37:19 Troy Hicks: @Maureen -- I would imaging that if they are putting those images on a timeline, annotating major events, and aiming it at an audience of their peers, it seems that Renee would argue that this would be considered fair use. 21:37:43 Troy Hicks: @Maureen -- what "benefit" came from building and sharing the timeline? 21:37:59 Troy Hicks: Was there a benefit? If so, in what ways? 21:38:33 Troy Hicks: @Maureen -- seems like fair use to me... but, ask Renee! 21:39:38 Fred Haas: Can we discuss music a little bit? I remember sitting in Renee's presentation in Philly (awesome, by the way) and music use emerging as a very sticky area, where things get even trickier. 21:40:54 SusanEttenheim: ahh minhaaj that's great! 21:41:26 Troy Hicks: @Maureen -- as someone else mentioned, I think, we are looking at Creative Commons as another mode of copyright protection, but that doesn't necessarily correlate to the academic idea of citation. 21:44:45 LangLabCindy: @Gail - wish Google would make it easier to find that option! 21:44:55 Maureen: I have the kids use images that are licensed for reuse- if it doesn't say it can be reused, I assume that it cannot, unless there is a "transformative" use. 21:46:21 LangLabCindy: @Maureen - sounds like a good plan! 21:46:26 Fred Haas: The whole inline linking and reblogging phenomenon does seem like a pretty subversive practice in this context. 21:46:28 minhaaj: To me, very idea of someone having an 'intellectual property' is asinine. 21:46:56 LangLabCindy: @minhaaj - Really? why? 21:47:47 SusanEttenheim: hi jack welcome! 21:48:05 Fred Haas: Isn't the very nature of our notion of authorship shifting and changing as we speak? 21:50:56 Maureen: But almost every site has a TOS... ie youtube, etc. 21:51:39 LangLabCindy: I'm a bit lost - can you please explain that again? 21:51:42 SusanEttenheim: where and what do you teach? 21:51:55 Gail Desler: Ewa is that you? 21:51:58 SusanEttenheim: which part langlabcindy? 21:52:14 mstejm@langate.gsu.edu: Yup, it's Ewa. How are you, Gail? 21:52:32 Gail Desler: Great - and really enjoying this conversation! 21:53:11 SusanEttenheim: mstejm - please introduce yourself! where and what do you teach? 21:55:37 minhaaj: This case is licensed to our university from harvard busines school and you are not supposed to copy it or take notes on it. 21:55:41 minhaaj: which was hilarious. 21:56:16 mstejm@langate.gsu.edu: Welcome to the vociferous defense of one's copyright ownership. Information as property. 21:56:30 SusanEttenheim: hi tunaguy welcome! 21:58:14 mstejm@langate.gsu.edu: I appreciate what the speaker is saying, and i agree completely about balance, but the J.K. Rowlings of the world are making too much money to let their intellectual output be "free." Even for educators. 21:58:31 LangLabCindy: And copyright law knows no age, right? 21:59:01 mstejm@langate.gsu.edu: Well, of course, the copyright term has been lengthened excessively, as Lawrence Lessig argued in Eldred v. Ashcroft. 22:00:02 minhaaj: Its sad that we learned nothing from classical case of Eldred v. Ashcroft and we got creative commons. 22:01:53 mstejm@langate.gsu.edu: Creative Commons is a nice resource; I wish there were more like it. 22:03:09 LangLabCindy: Renee - are these process questions posted somewhere? 22:04:20 mstejm@langate.gsu.edu: Thanks. I bookmarked copyright friendly. 22:07:32 Gail Desler: The reasoning form is a great resource and activity! 22:08:47 Fred Haas: I had to do that very thing last semester with one of the projects I was doign with a class. This semester, I will bust it all open a little more. 22:09:06 LangLabCindy: We try to have the teachers understand that copyright is not a check-off item - it is a process. 22:10:01 Maureen: For those of us who were used to the list- 30 secs of this 200 words, etc... it is a big change. 22:10:34 Troy Hicks: @Maureen -- indeed, a major change! 22:11:10 Maureen: Renee is going to be at educon- oh good! 22:11:29 mstejm@langate.gsu.edu: Yes, it is regrettable that so many people were under the impression that there were hard and fast rules of proportion, like 20 seconds or some other period was "OK. The law NEVER had such rules. 22:11:39 Fred Haas: Thanks for everything all. Good night. 22:12:12 mstejm@langate.gsu.edu: Thanks for the great conversation! 22:23:00 dude: is anybody ther?